Even though I am on a juice fast (day 22 and counting) my husband still needs to eat and so I try to make quick and easy recipes so I'm not tempted. He said that he would go on the fast with me, but he has an intense job and I think that it would be harder for him. It also helps that we've had warm weather and so I'm not tempted to cook anything. The meals that I have been preparing hardly utilize the stove and so the smells of cooking are not throughout the house. I purchased these noodles made of "tofu" at my local Sogo Tofu shop. They make these noodles fresh daily along with 30 other types of tofu. 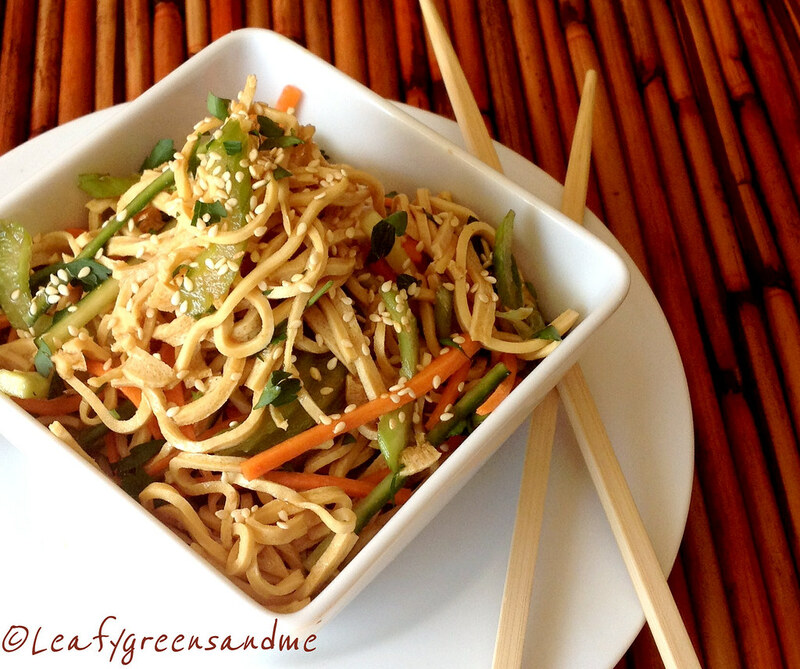 You can probably find similar tofu noodles at an Asian market or substitute brown rice or wheat noodles. Since I'm trying to keep my food preparation under 15 minutes or less, I just added thinly sliced celery, and julienned carrots and cucumbers. For the sauce I whisked together in a bowl rice wine vinegar, mirin, low-sodium soy sauce and toasted sesame oil. Finally, for added flavor I topped the salad with chopped cilantro, green onions and toasted sesame seeds! Super easy for me...delicious and healthy for hubbby!